What many had feared could end up as a poor weekend for Galway footballers, turned out to be an overwhelmingly positive one with a deserved national league win away to Monaghan in Inniskeen. With a high number of unavailable players, Galway were against the ropes from the start, but they showed fight and determination to grind out a 0-11 to 1-12 win. This was not a team that was expected to beat a fancied and well-drilled Monaghan outfit, with Seán Kelly deputising at full back, Johnny Duane at centre forward, both Antoine O’Laoi and John Daly getting their first taste of league action, and David Wynne straight back into the team despite being unfit the previous weekend. However Daly and O’Laoi did not show any lack of experience, producing fine performances, and although Galway struggled early on, Monaghan could not handle them when they got into their stride. Galway went ahead against a strong wind in the second half, and when the ball broke to Danny Cummins, he laid it off to Heaney who made no mistake in putting his team five ahead with 10 minutes remaining. Galway managed to hold out to get the win they deserved. Sunday’s result will have Kevin Walsh and his side hopeful that by the end of March they will not be looking over their shoulder or depending on other results. With Dublin and Monaghan losing again, and the poor form of both Cavan and Tyrone, this win leaves Galway lying in third position, and one more win should keep them safe for another year. With Kerry and Roscommon at home, and Mayo and Tyrone away, the Tribesmen will look to pick up more than just the two points required. The possibility of the Corofin players being available after this weekend, the return of Michael Daly in Inniskeen, and expected returns from injury of Comer, Brannigan, Kyne and O’Ceallaigh over the next number of weeks, ensures the Galway panel will be in a much healthier position than it was three weeks ago. Last weekend's man of the match Seán Kelly had Monaghan regularly on the back foot even with the aid of the wind in the second half. Once again Galway were trailing by a point at half-time, but unlike the previous week in Croke Park, they came out fighting in the second half. Antaine O’Laoi scored right from the throw-in and won an easy free for Walsh to convert in the first couple of minutes. This had the Farney men on the back foot. Galway started to press home their advantage. 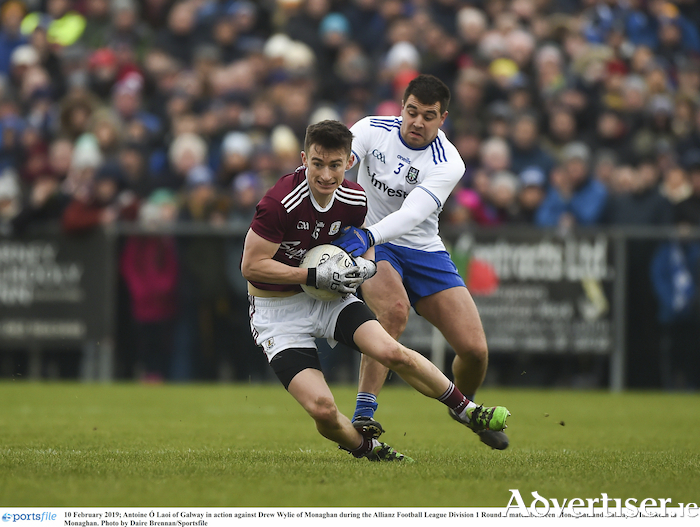 Forcing a long Monaghan kickout, which was dealt with well by Galway’s defence, they kept Monaghan to just five points in the second half. Galway’s next game is at home to the high flying Kingdom in Tuam Stadium on February 24, and if Walsh can get some absent players back to match fitness in this two-week break, they will go into this game full of confidence and fancy a victory.